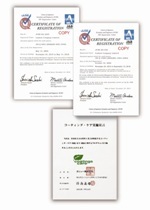 Environmental Statement | Cashew Co., LTD. They are TXSL(toluene, xylene, styrene free) coatings which minimize the effect to the environment, water borne coatings without using petroleum as a solvent derivative and UV hardening coatings where drying time is reduced to less than one second in order to save energy. All Cashew’s competitive coating products are “Green” showing consideration for the environment. Having developed environmentally friendly and protective coatings earlier than many others, Cashew is a pioneer and seeks to be only one industry in the field of ecology by concentrating on the development of technologies that minimize the burden on the environment. It is a corporate responsibility to focus their generous efforts on the improvement of the global environment. The problem of global environmental destruction such as acid rain, CFCs, and disruption of ecosystems, etc., has entered a critical stage. It cannot be denied that business activities are partially responsible for this deterioration of the environment. Coating material makers like us have been highly interested in environmental issues. Most of the solvent that accounts for 60 to 70% of coating material eventually disperses into the atmosphere. How to minimize the use of this solvent (especially organic solvent) has always been one of the most important challenges for us. As a countermeasure against this problem, coating material makers have been conducting active research in areas such as "aqueous coating material" that uses safe water as a solvent, "high-solid coating material" that requires less solvent, "powder coating material" and "solvent-less coating material" that requires no solvent, and "UV coating material" that hardens coating material using UV light. Untiring efforts by Cashew are now bringing great achievements. Cashew's efforts toward making low-polluting coating materials dates back to 1965-1975. Cashew's research activities have been mainly focused on "Aqueous coating material" and "radiation cure coating material". Our efforts have already reached beyond the searching and now our products are in practical use for automobile parts and home appliances. Further, in terms of low-pollution coating material, Cashew is looking toward making all the coatings aqueous. And now, we are into a new era, putting into practice how we can contribute to society by making low-pollution products through a "closing of coating system" (radiation cure coating material, coil coating material, etc.). Cashew will make every effort to advance in such a way as to be able to pride ourselves on being a cutting-edge ecological company. What is Coatings Care ? It is the exercise of self control and responsible care activities to which chemical industries internationally are committed with the aim ofto protecting health, safety and the environment. With the International Paint and Printing Ink Council (IPPIC) as coordinator, draft programs are periodically prepared and circulated to member countries in order to create a coatings care program that meets each country's requirements.